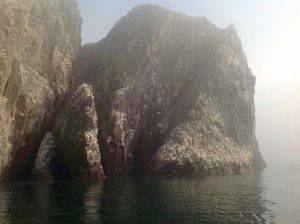 The Bass Rock photos in this post are unlike any others I’ve taken. I took them on my much-missed i-Pad and they bring back the ambience of our foggy boat trip out to the Bass. 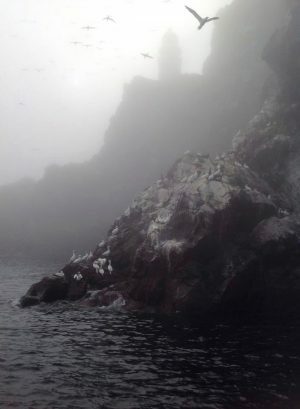 I’d just booked a visit for Stephen and myself around the Bass Rock near North Berwick (in Scotland). And I was a bit worried when I saw the weather. A sea haar was rolling into the town from the Firth of Forth and up the Law, the big hill at the edge of the town. And it turned out to be a blessing in disguise. It was days from the independence referendum of 2014. And around East Lothian we saw boards bearing the words Yes or No. Neither could sway me, however. I was still living in London and didn’t have a vote. I won’t say which box I would’ve ticked. But I thought today would be a good opportunity to reminisce about this inspirational visit. So here’s the Bass from the beach at North Berwick on a delightful midsummer evening. And those are the rocks I’d climb as a child. 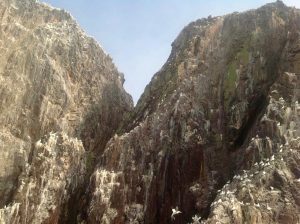 The Bass Rock is a seabird colony and the Seabird Centre will furnish you with all kinds of information about it. There’s a nice cafe there too with a view of the Firth of Forth out towards the rock itself. And it’s one of the places where you can book a boat trip out to the islands* to get a glimpse up-close of the seabirds (and their droppings!) that turn the Bass white from grey each summer. Meanwhile, the Bass houses a lighthouse and when I was a child there was still a crew manning it. I remember my Granddad taking me on a visit aboard Sula. It was a choppy day, but the captain still managed to pass the lighthouse keepers their post and newspapers. Incidentally, after that visit I asked Granddad how the islands stayed afloat. “Ach well Emily,” he said. “They’re fastened to the seabed by big chains, so they’re very secure. I think Harry Haston may have been pulling ma wee leg! And so back to our boat trip. 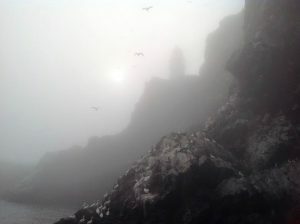 Despite thinking that the visit out to the Bass Rock would be spoilt, the sea haar totally made it. As we stood at the harbour we heard the boat coming in, but couldn’t see it. It took about twenty-five minutes to reach the Bass, with a quick swing by Craigleith island, another in the chain. 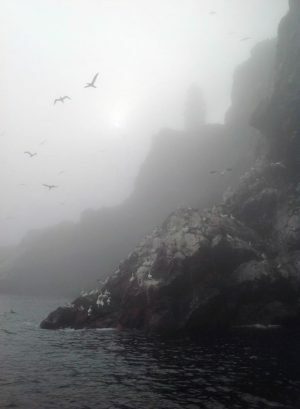 The haar, or sea fog, made the islands appear eerie, fuzzy and other-worldly. 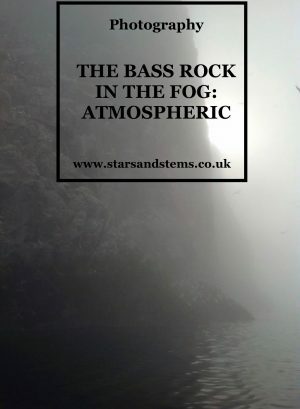 The outline of the Bass that I know so well from dry land was softened in the haze. And it was interesting to have a good old up-close-and-personal of the rock itself, seeing how all the various bits overlap and fit together. I love that tiny wee blip of rock in the top photo, clearly visible from shore, and see that a bird has managed to park its bahookey on it. As mentioned, I took these photos with my long-gone (or should I say long-stolen iPad). And unfortunately I hadn’t upload them onto my computer when the device was snatched. Luckily I’d posted them all on good old FB so had plenty to download, but no doubt the quality has diminished. I wrote in my previous post that I’m certainly no photographer. I have next to no technical knowledge. But I do like photographing what I like and I’m confident I have an eye. I’m a big fan of grey mist and dreich weather. Not, I’d like to point out, because it reflects a dour and miserable personality. Simply because I’m not good in hot temperatures. 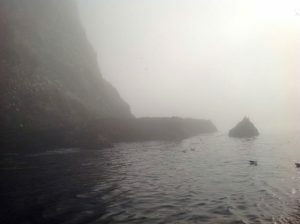 Plus fogs and haar suggest all things mystical to me: the Isle of Avalon, valkyries, magic. All heightened by the birds crying as they encircled the Bass and the boat. But good grief, THE PONK! And here are the culprits. 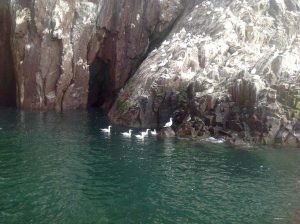 Big smelly seabirds – cormorants, gannets, puffins. I don’t know how they even stand it! But how wonderful to be so close to these creatures, observing them dipping into the sea to seize unfortunate fish and build their nests. There’s also an almighty din with all those seabirds in such close proximity. 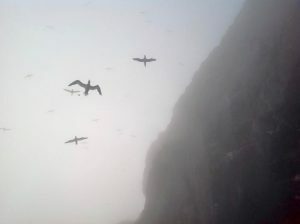 Doubtless, the volume dips come-October when seabirds fly south and the rock returns to grey. Our boat trip also did a quick circuit of Craigleith, one of the other islands in the Forth. Apparently it’s a bit of a haven for rabbits. Getting up close is a treat for photographers and artists since you can observe all that volcanic rocks, the angles and how the whole structure settles in the water. Did I say structure? 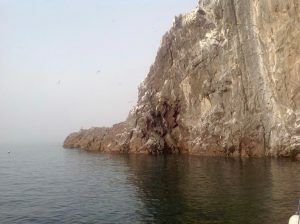 Indeed, these rock islands are like beautiful, natural sculptures. 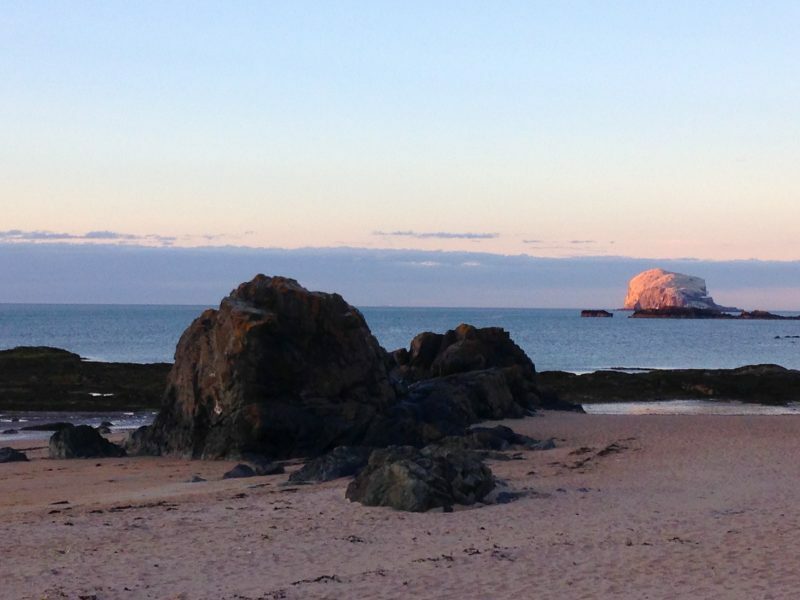 And there are two others nearby, the Lamb and Fidra, clearly seen from North Berwick. They add so much interest to the coastline (and probably help to hike house prices!). In fact, all other beaches seem lacking when I compare them to this one – where are my islands? A wee fact: a few years ago the Lamb was snapped up by Yuri Geller. He believes that it sits on a leyline that connects up to Rosslyn Chapel and, much further south, Glastonbury itself. And then, just like that the mist cleared. 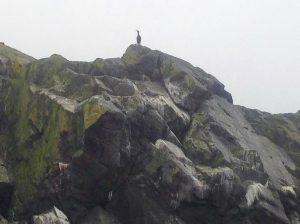 I’m looking forward to another Bass Rock visit, though I’m certain the conditions won’t be the same. It’ll still be spectacular and I’ll get some great photos. And so the lesson for the day is… the unexpected often makes things even better! As an artist (rather than a photographer) I’m tempted to use these paintings for some art. But would this go against my number one rule to never paint from a photo without a sketch. But I can’t deny this would make a fab piece of glass art. What do you think? Can I get away with it this once? Leave me a comment below. "My 9 Favourite i-Phone Photos"